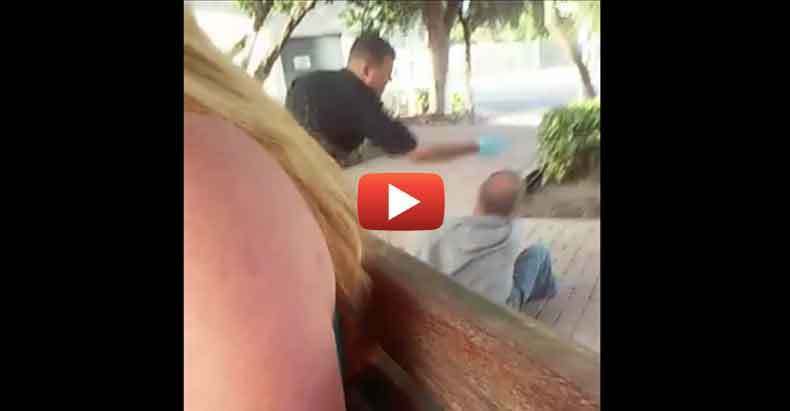 Ft. Lauderdale, FL– A video uploaded to YouTube on Sunday shows Fort Lauderdale police officer Victor Ramirez harassing and assaulting an elderly gentleman at the Broward Bus Terminal in downtown Fort Lauderdale. The man is not being aggressive or threatening in any way when he is shoved to the ground and slapped by the officer. The man was reportedly trying to use the bus terminal’s restroom. The man in the video has been identified by Local 10 News as Bruce Laclair. He is homeless, and witnesses say he was only trying to go into the terminal to use the restroom when the Officer Ramirez began harassing him. Ramirez reportedly told Laclair to leave, but the older gentleman informed the officer he was just going to use the bathroom first. “I’m telling you right now, you’re not going to go pee,” the officer says before shoving Laclair to the ground. The out of control officer is then seen slapping the harmless man across the face. “I’m not f**cking around with you. Don’t f**king touch me. Don’t f**cking touch me.” Ramirez is heard saying before arresting the man seemingly for just trying to use a restroom. While this video is indeed shocking and dramatic, this criminalization of being homeless is certainly not an isolated incident. It has gotten so out of control that the act of existing seems to be a considered a criminal action by our government. Ft. Lauderdale has been at the forefront of this, as they made national headlines in December for arresting people simply for feeding the hungry. 90-year-old Arnold Abbott was at the center of the scandal, as he refused to comply with the local ordinance against feeding the homeless. The wonderful man continued to feed anyone who was hungry despite multiple arrests and fines. In some cases, Abbot was back on the streets the very next day after getting arrested, only to be shut down minutes later by police. As his story made headlines and videos of his repeated arrests went viral, a judge was forced to suspend the ordinance due to the public outcry. Other recent examples of cities with these inhumane ordinances range from Daytona Beach, Birmingham, St. Louis, Raleigh, Philadelphia and Orlando. If only we had more officers who acted less like violent thugs, and more like Sgt. Brian Taylor of the Provo Police Department. Taylor set an inspiring example of policing and showed a rare glimpse of humanity in a police force when he launched a fundraising campaign for coats that convert to sleeping bags for his city’s homeless population. If they refuse to help, they could at least not hurt. The war on people’s right to exist needs to stop. Allowing a human being to use a public restroom hurts no one. Officer Ramirez is now on a paid vacation while the incident is being investigated.